Why Choose the Chemistry Program? The Bachelor of Science curriculum in Chemistry approaches students' educational endeavors with a broad, integrated, and in-depth view. Departmental requirements, combined with university core requirements and electives, offer a balanced course load for students. This provides undergraduates with the opportunity to explore where their interests in the science field will lead them. 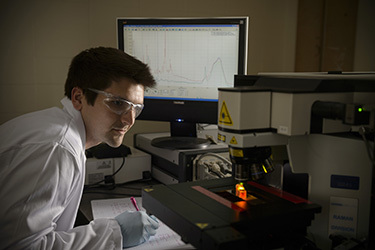 The Department of Chemistry participates in the university's dual major program, providing a degree with an emphasis in Chemistry and another area of study. The basic requirements follow a curriculum of 37 credit hours of Chemistry, 8 credit hours of mathematics, 10 credit hours of physics, as well as the university's general education requirements, and must be integrated with a corresponding program from another participating department with 36 credit hours from that major. View Bachelor of Science in Chemistry program information, degree requirements, and graduation planning strategy in the University Catalog. Students must apply for admission to Wright State University. To apply for admission in the College of Science and Mathematics, students must fill out a “Change of Major” form and declare their area of emphasis (this can be done online through WINGS Express). Wright State has articulation agreements with a number of institutions. Articulation agreements will assure you a seamless transfer from one institution to another. To view current articulation agreements and determine which courses will transfer, visit the Articulation Agreements page or www.transfer.org. Monday-Friday, 8:30 a.m. to 5 p.m.